YES this is our Real Luggage we brought over! and it was Way too much. Originally we were going to ship 21 large boxes with full kitchen/household linens/accessories and personal clothing items. I spent days and days and even weeks trying to figure out a shipping company that was legit and never found anyone and it was going to be around $2000! 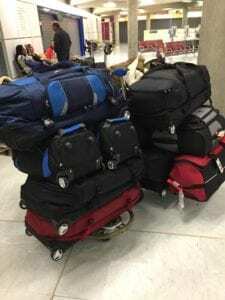 We gave up on that idea and I can save you a ton of time and money; if you aren’t being moved by a company or the military the cheapest way to move is the dumb airlines luggage overage charges! you can get ALOT in luggage and the price of airline fees is cheaper than ANY shipping that isn’t a full container. If you have less than a container than there truly is no cheap way, forget postal/fed ex no longer does it and I never found any other way. BUT, however, if you are moving over, I would recommend taking Half of what you think you want/need! What not to bring? First and foremost, too much clothing! Trust me there are stores here with tons of cute fashion! Shoes, there are Tons of GREAT shoes, better shoes in some cases than in America. And if you are going mobile traveling and not renting a flat, then you REALLY need 1/3 of what you think you want/need. What you use/need in America is Not what you need here. and it becomes a major burden to lug all this stuff with you. Find a way to keep it back home until you have been over here awhile and KNOW you are staying forever. Know you miss it enough to think about it while traveling, and then bring it over. Meantime keep it simple and bring only the basics.